Amber Ghent’s more than a decade of teaching experience includes time on faculty with the Cleveland Music School Settlement, KW Cello Suzuki, and, since 2007, with the Suzuki String School in Guelph. She has completed training in all Suzuki units, and is currently training to become a licensed Andover Educator in order to help musicians avoid injury and play with ease. Amber enjoys teaching at summer festivals, which recently included the Suzuki Institutes in Waterloo and Valhalla, as well as the Kincardine Summer Music Festival, Lakefield Music and the Oakville Performing Arts Camp. A versatile chamber musician, Amber has been cellist with the Madawaska String Quartet and Ensemble since 2007, performing and recording a wide range of repertoire and appearing at major venues throughout Canada, including Festival of the Sound, the Toronto Royal Conservatory’s Koerner Hall, the Elora Festival, and the Indian River Festival in P.E.I. She has also performed with a variety of ensembles, including Tapestry New Opera, the Kitchener-Waterloo Symphony, Orchestra London, and the Erie Philharmonic, where she was assistant principal for two seasons. Amber is well-known to the K-W musical community, having performed regularly at local venues, including the Music Room, the Centre in the Square and Maureen Forrester Recital Hall. 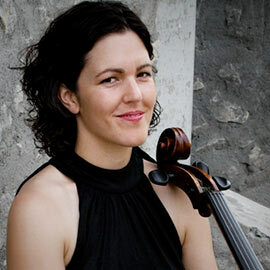 She began Suzuki cello at age seven with Jo-Anne Goyder in Kitchener, and earned a Bachelor’s in Music Performance at Wilfrid Laurier University under the tutelage of Paul Pulford. After studies in San Francisco with Bonnie Hampton, she completed her Masters in Performance studying with members of the Cleveland orchestra.